05:30 hrs yesterday in front of the Ketley Primary School in Charlestown, where he has been vending for the past 20 years. 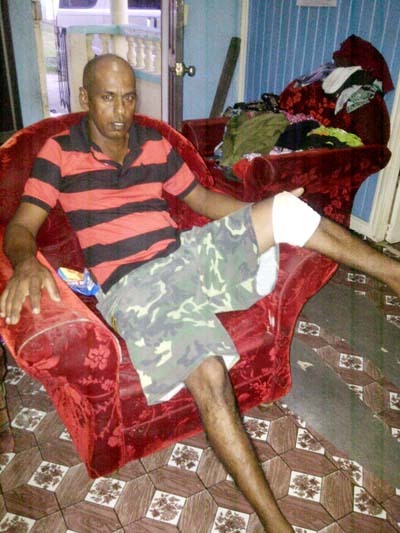 The injured man has been identified as 48-year-old Vincent Ramkissoon of 1043 Belle West Housing Scheme, West Bank Demerara. According to Ramkissoon, the bullet exited just a little below his knee. He was treated at the Georgetown Public Hospital Corporation and discharged. During a telephone interview, the vendor explained that he would usually leave his home early in the mornings and travel to the school to organize his stand just in time for when the children arrive. “While fixing my stand, I notice a guy on bicycle pass in front of me, but I didn’t pay attention, I was busy fixing up my stand,” the vendor recalled. He added that he was sweeping in front of his stand when he heard a noise behind him – this was approximately half-hour after he noticed the cyclist. “When I hear the noise I turn because I thought someone fall down. When I turn, I see this same guy walking towards me pointing a gun,” Ramkissoon said. He added that the man demanded that he empty his pockets, following which he was instructed to open his car when the alleged bandit realized that the vendor was only carrying the keys to his car on his person. “He tell me walk to the car and open it. When I reach to the car, I turn to him and I tell him I would not open the car, and he shoot me,” the vendor said. He added that his car keys fell out his hands and his attacker grabbed them and tried to open the vehicle, but he was intercepted by a nearby resident who pelted a bottle at him. The vendor was then rushed to the hospital where he was treated. Despite being attacked, Ramkissoon said that he will not stop vending in front of the school since he has been operating his business there for a number of years. He said that his attacker was wearing a brown jacket with a hood and black jeans.